Small Patio Pellet Heater! View Fire from 3 sides! The amazing wood pellet patio heater. Stainless steel construction used throughout the unit, where important, including the Top reflector. New Corrosion resistant Finish Looks amazingly clean and is of the highest quality finishes ever used. the rear mounted pellet hopper included shut off key and burns for 2 hours unattended. An optional pellet hopper extension available to more than double burn time. New “V” Channel Fire Grate keeps the ash content concentrated downward helping eliminate ash and make the cleanup a breeze. Stainless Hardware not only looks pretty but ensures the easy adaptability of future Accessories. 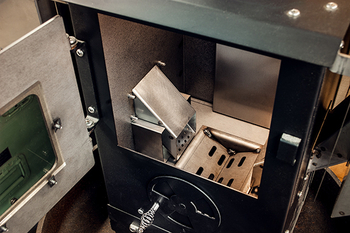 Heavy Duty 14GA Firebox and 10ga fire plates ensure the longevity of the product. 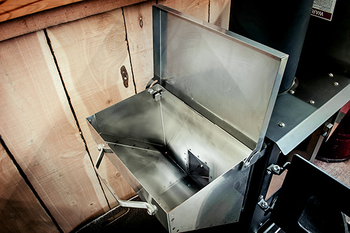 The 5 lb hopper allows the use of single hopper feed for lower temps for lower ambient temperatures. 50,000 Btu Output ensures the whole party gets to stay warm (10' radius, 300 square feet)! Pellets reduce the operating cost of propane by approximately 75%, and produce twice the heat! No other product on the market compares to what your about to buy! 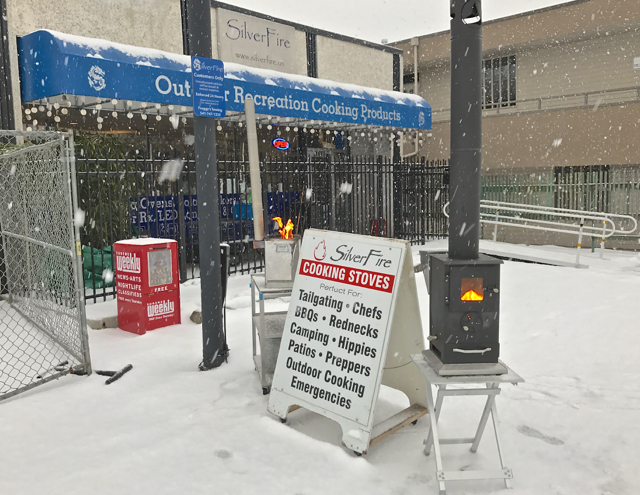 Perfect of your outdoor recreation or emergency outdoor heating needs! 50,000 BTU’s – 2X that of any other patio heater. Heavy Duty 14 Gage Firebox and 10ga fire plates ensure the longevity of the product. Stainless steel throughout the unit including the Top reflector. New Corrosion resistant Finish of the highest quality. Pellet limiting hopper shut offs. All Hardware is stainless and ensures the easy adaptability of future Accessories. 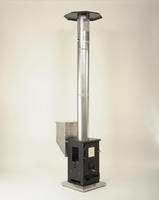 The latest version of this Patio Heater shows forward progress in the advancing patio heater market. 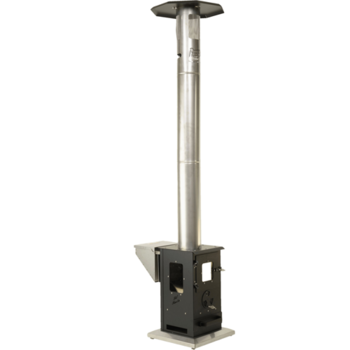 This is the first patio heater to burn an alternative and renewable fuel source, “Wood Pellets”, thus moving away from the traditional propane heaters. By designing the functionality of having Dual 10 lb Gravity Fed Hoppers, each contains a pellet limiting shut off gate. The new “V” Channel Fire Grate, keeps the ash content concentrated downward by gravity, helping eliminate ash and make the cleanup a breeze. Shown below with optional pellet hopper extension (adds couple of hour operational time $45.00). The number one reason why people buy this patio heater is for the amount of heat it can produce. 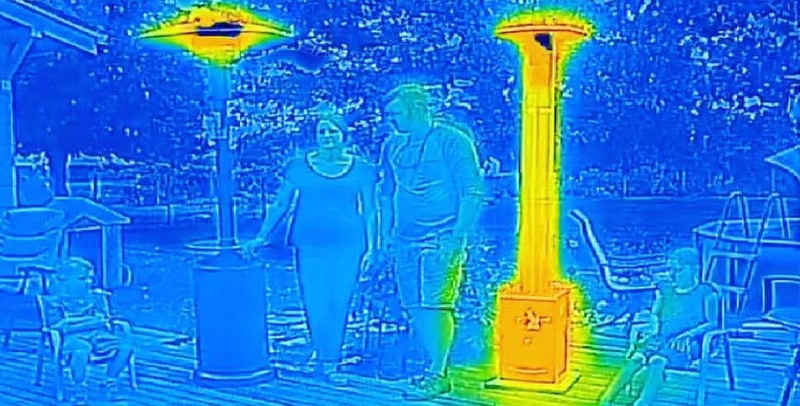 The Patio Heater radiates more than twice the amount of heat as any other patio heater on the market. At 50,000 BTU’s this heater ensures the whole party gets to stay warm and experience the ambiance of true wood fire flames. There is not another product that can compare to the Small Patio Heater.